Let’s say a man crosses the street in a city called Alpine in the elbow of south Texas, a hundred miles from the limestone isolation of Big Bend, those canyons carved into a weather-beaten desert that feel like the end of every road, like everything carried down it falls into the chasm, never heavy again. This man, wearing pointed-toe boots and an itch to get nowhere, stands in front of the post office on 13th street, and he steps up to the dusty windows and cups his callused hands around the edges of his eyes and peers in because the building’s been closed for years. He stands there a long time, as if in study. Behind him, wind kicks up the dirt and holds it in the air for a second then sends it on toward the train tracks that used to be the Sunset Line. He squints against the glare of his memory, to the blue-lined letter he opened inside all those years ago with shaking hands. Let’s say this: he waited for those words more than any he could remember, and he’s still got them in his back pocket, in his wallet, the crease of that single page thin, those blue-lines faded to silver. He leans over to get a glimpse of the mural on the wall, the one with the Guadalupe Mountains in the distance and those three strangers, a woman and two men, reading in the middle of the desert, each of them singular in their separation. Let’s say the writer of that letter is like the woman on the wall — dark hair with a book before her, always something before her, something to do with wondering and wandering and a way that feels like she’s always about to walk out a door. Something far away in her shoulders, in the way her right hand cups her chin, the way she’ll pay more attention to what she can’t get more than any man who watches her, or doesn’t watch her, either way. Let’s say this man, every time he used to step into that post office, worried the woman on the wall was watching him, reminding him of that afternoon the woman who wrote the letter took those four steps down his front porch. Let’s say what this man drags behind him along the streets of Alpine and through the mountains in the distance and down into the canyon at the end of the road is that afternoon, that screen door slamming, and him not turning to watch her go. The man heads down 13th toward Holland, to where two streets come together and Railroad Blues waits on the corner. The blue oval around the red neon open sign in the window bright even in the southern sun. Let’s say he already knows the names that belong to the shadows that curve toward the bar, the sound of his own steps on the pine floor. He slides into the dark and lets his eyes adjust for a moment to hear Waylon on the jukebox in the corner. Drinkin’ and dreamin, knowing damn well I can’t go. The man’s boots echo onto the empty dance floor. He puts a hand on the back of the stool he knows, the one nearest the register, which stands for what costs him. The daytime bartender, and let’s say her name is Helen, has nice skin and rough red hair that fringes the flower pattern in her leather belt. She sets down the bottle before the man can set down his story, because that’s what shadows in bars are working to do, to carve their stories into the wood. He’s staring into the label of the bottle, the label of his days, and he keeps himself from looking at the pay phone on the wall, the one he’d lean into every time he dialed her, the woman who wrote the one-page letter. He called her until one afternoon — after the sun had already gone behind the mountains — when he assured her that yes, he wouldn’t call again. He keeps even his eyes away from the silver numbers, the black receiver, the taut cord. He presses his two fingers around the neck of the bottle the way he pressed them that day on the silver lever to end the call. This is all he knows of apology. Let’s say that while the sun is still up, they call it Day Blues, and nobody in there pretends it isn’t true. He likes walking over to the bar almost every afternoon when the shadows inside are nothing more than what everyone’s running from, what everyone in this small town already knows. Everybody knows since she left town he keeps to himself, walks down the steps of his two-story on 13th to Holland after finishing up whatever job he got up early to do. He built a new fence for the writing professor they just hired at Sul Ross because, someone heard, she told him she didn’t feel safe in that house on Lockhart without one. Let’s say he’s been restoring the front porches on a bunch of those houses off Old Marathon Road. And that once a month or so, he takes that road thirty minutes out to Marathon, and someone said it’s to spend a long afternoon with the kind woman who owns the art gallery there, and that by the time someone catches the blue bed of his old Chevy C10 truck turning the corner back into town, all the streetlights are on, and most of the time, he’s got the windows of that truck rolled down and his fingers tapping on the top of the window’s frame — tapping out whatever song he’s got on his radio, or whatever song he’s probably singing to himself. He’s always singing, or humming under his breath, into his beer, over the clean boards he measures, and through every boot-step into the Blues. The jukebox runs through its records to find the song somebody punched numbers to hear. The click of the record drops down, and through that bar-during-an-afternoon stillness, the sizzle before the first notes of the song runs through the air like wind through a ghost town. Like hesitation, like a dial tone that’s left him nervous, as if he’s being chased, and he is, by the woman who wrote the letter, the woman so far gone it’s as if she might come all the way back around again. The whine of the steel guitar, the waltz of the rhythm, and then the words. Everyday I tell myself it’s temporary. Gary Stewart’s “Drinking Thing” wails against the backs of the men in their flannel shirts and their worn-to-thin leather belts and their scuffed boots, their we’re-not-doing-a-damn-thing-but-drink-today weary. The thing about ignoring is that it’s pretty close to paying attention. Stewart’s heading toward the chorus now. And that line about wondering where you been, who you’ve been with empties him of all he’s got so he empties the bottle, raises it up to catch Helen’s attention. Helen moves like water, like she’s a steady stream that knows every rock and bend of herself. Nothing like the woman who wrote him the letter, the woman who struggles against her own currents. Let’s say she always wanted to get out of herself somehow and pour whatever was left into some other place. He knows her tendencies, her tenderness, the way she tends to walk out any door just so she can walk through another, so she can enter an empty room, so she can map her body toward some good-for-nothing man. Let’s say he was good to her. And let’s say every time he’d drive his truck out to town, to some one-story motel, she’d lean against the doorframe in the minutes just after he loved her as if she had to put something between them. He’d watch her from the bed, watch the outline of her face, her eyes set on the strange city, and he’d listen to her ask what it might be like to stay. He couldn’t understand this, but he wanted to. But this kind of listening is like calling out in the roar of a storm, useless, because when a woman won’t take the good, she’ll take off. He knows that wherever she is she’s near a man and she’s carrying something heavy with her, and somewhere, in a drawer in her kitchen or one next to the thin-comforter of a bed in a motel room in the middle of a town, she’s got a pack of Marlboro Lights even though, let’s say, she stopped smoking years ago. He understood this about her, how she always kept something close to her she knew was no good. It’s always been a battle, a way to keep herself away from trouble, those Marlboro packs a warning against surrender every time she opened a drawer. Let’s say she’s thinking: I want to go back to before. The Stewart song’s over now, and a man in Carhartts leans over the glass, looking through the records for the one he always plays after the third beer. The word for this is defenseless. The folded up letter the callused-hand man keeps in his wallet — the one he opens with his worn-to-rough hands, the letter in the creased envelope and the postmark from Dallas, the one with the fading words — is like her cigarettes, except in his case, it’s like a phone call from a stranger, asking him to build her a fence. And let’s say the sun’s starting to set and the lights from all the neons along the edges of the Blues blare to shimmer on the hardwood floor, a spilling of yellows and reds and greens like puddles, and the man in the Carhartts has pushed F 37 and it’s not fair, the bounce of those piano chords that belie what he bears on his steps back to the bar. Helen sings along while she dunks one pint glass after another into the suds of the sink. Here you come again, just when I’d begun to get myself together. She knows all the words, not because the man in Carhartts plays Dolly Parton every time he stops by on his run from El Paso to San Antonio but because everyone has someone who’s come back, again, and when a jukebox drops the right song, or the wrong one, no one’s singing along to the song, they’re singing along to someone. It’s like a dropped bottle on the floor, all those shards, the way strangers won’t raise their eyes to pretend it didn’t slip, pretend it didn’t spill, pretend it wasn’t their own shattering. Let’s say the man with the callused-hands pushes himself up from the bar to the line you waltz right in the door, just like you’ve done before. He nods to the man in the Carhartts and says something like doesn’t take a door to keep someone from going or coming back through it. The man in Carhartts has a spindly, red-flecked beard, and he raises his Bud Light bottle toward the callused-hand man and offers to buy him another. But let’s say there’s something I forgot in the telling, that the callused-hand man locks a door on his drinking every afternoon when the sun goes down, whether he’s finished or not. And this time the sun set halfway through the second bottle. Something to do with shutting at least one thing out before the dark speeds toward him like those rails that run through this town, that train whistle howling in the wind. That wail sounds different to him in the night, and if he goes too far into his drinking, he almost doubles over at the thunder bearing down. He steps out of the door of the Blues and stops for a second to shake hands and clap a back or two with the men and the women out front, the ones shrugging in their leather coats, poking at the logs in the fire pit, the fire that will burn steady and crack, shoot its own neon orange into the air til the bar closes down. Let’s say the smolder, the dusty ash settling in the middle of the night is something close to a phone ringing in a motel room after check-out. The man passes the dark windows of the post office on his way back home, and he doesn’t stop this time but closes his eyes, even while he steps down the sidewalk, even while he starts to imitate the stride of the man in the Carhartts, the stranger whose steps falter as if he’s about to fall against everything he’s driven away from. The callused-man sings, like he always does, but this time he doesn’t realize what he’s singing, the song he asked Helen to take off the jukebox. She told him when he asked that he had to take the record with him, and she waited for him to nod yes before she grabbed the keys from beneath the bar and handed them over. Let’s say the breaks in his steps feel like surrender. He can see the mural in his mind, the one on the post office wall, the one he’s looked at so many times he sees the reds and the browns and the deep oranges of the desert and the woman in the painting wrapped in yellow and blue in his mind. It’s the mural of his memory, the woman who surely meant something he couldn’t make out when she tried to write it down. He gets to the corner and it’s then he hears himself, singing the song. And he opens his eyes, lets out a long breath. And let’s say this is the heaviness he’s carried through every distance and dark bar until everything’s awash in dust and cedar. The next morning, he gets into his truck toward an early start on Old Marathon Road. When he pulls into the lot of the art gallery, he’s got a box, the one with the record and the letter and the stack of plane tickets, one to every city where she might be, because today he’s setting it all down. And let’s say when he walks in, the bell above the door trembles, and the long-haired woman steps from behind the curtain, her sandals shushing the hard floor, and she nods behind her, says everything’s right where he left it. He has a word in his throat. Let’s say it’s allow. And let’s say when he ducks behind the orange and red and deep brown curtain, he sees it there, the canvas, the desert, the empty space where the woman should be. And let’s say he picks up the palette, squeezes tubes of yellow and blue. He smudges his brush into them both, one at a time, and let’s say this is the afternoon he will finish the form of the woman who wrote long ago. When he presses the silver-blue brush to the page, he can see her words there, between them. And let’s say he’s humming. 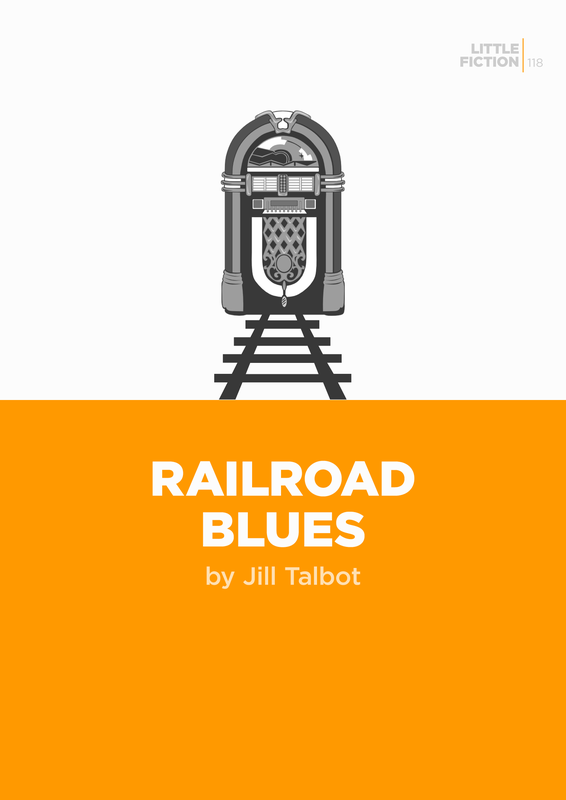 Jill Talbot is the author of The Way We Weren’t: A Memoir (Soft Skull, 2015). Her work can be found elsewhere online in Ascent, Brevity, DIAGRAM, Hobart, The Paris Review Daily, and The Rumpus. LF #118 © 2018 Jill Talbot. Published by Little Fiction | Big Truths, March 2018. Edited by Beth Gilstrap. Cover design by Troy Palmer, using images from The Noun Project.